Just wrap some paper around a chocolate bar and decorate it. It’s that easy! Make a series of cards to open at a certain time. This gift is super cute and simple, yet extremely meaningful! 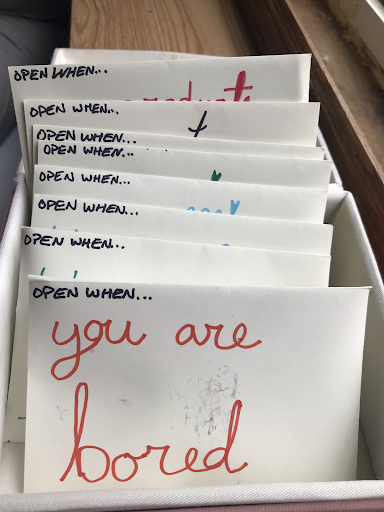 For example, open when… you’re bored, you’re sad, you’re sick, you miss me. The possibilities are endless. This DIY is pretty straight forward. Just write a bunch a reasons why you think someone is great. Not only is this perfect for a boyfriend/girlfriend it’s also perfect to give to friends. This DIY is a classic. Make a little message to your loved one using candy! You can find a plethora of examples online, so find what you like and make it your own! Write out your favorite memories with the person you plan on giving the gift to. Put the pieces of paper in a jar that you have decorated to your liking. This gift is so thoughtful and extremely cute! Just buy an all white or all black mug and decorate it with sharpies! If you plan on using a black mug you will have to use metallic sharpies in order for them to show up. This gift is also perfect to put some little candies or even a small card into. Also, if you want the sharpie to last a long time make sure you hand wash the mug.